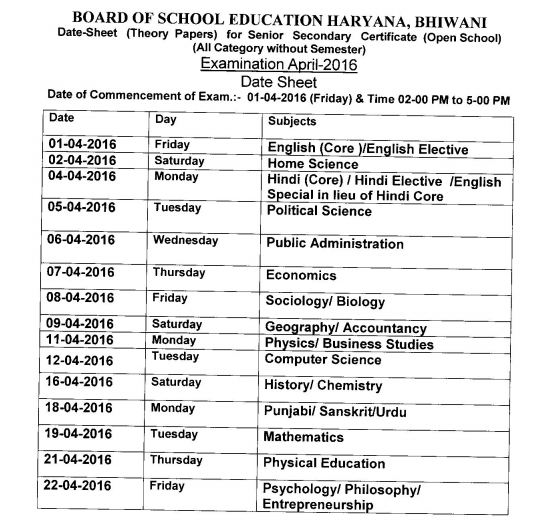 The Board of School Education Haryana has been issued the Hall Ticket/Admit Cards and Date Sheet for Class 10th and 10+2 Secondary and Senior Secondary Exam.The examination will be start from 01.04.2016.The examination will be start from 01.04.2016 and the last date for examination is 22.05.2016.These examination will be held in all districts at various exam centres. According to the spokesman of the Board of School Education Haryana HOS Admit Cards now available on official website of HBSE www.bseh.org.in.So many candidates from various districts like Hisar,Mohindergarh,Gurugaon,Rewari,Kaithal,Panchkula,Fatehabad,Sirsa,Kurukshetra,Kaithal,Karnal,Ambala,Bahadurgarh had filled their examination form and going to appear in this exam. Examination from 01.04.2016.Time 10:00 PM to 01:00 PM. 11.04.2016= Social Science.12.04.2016 =Sanskrit/Punjabi/Urdu/ Home Science/Computer Science/Physical Education. Exam from 01.04.2016 and Time-2.00 P.M. to 5.00 P.M.